Boil the cream and milk with sugar in a deep non stick pan. Set aside to cool down to room temperature. Mix the gelatine in four tablespoons of hot water and stir it into the milk. Transfer the cream-milk mixture into a bowl, add the strawberry crush and mix well. 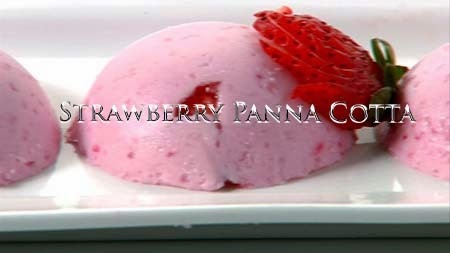 Put the chopped strawberries into eight ramekins or moulds and pour the milk-cream mixture into it. Place them in a refrigerator for three to four hours to set. Serve chilled.